My course is done, I got an A, and I am off the Spain at the end of the week. I love that feeling that comes with checking off one more course - bringing me closer to my degree and the absolute glorious freedom from papers and reading boring textbooks. Soon, I will be sitting in an outdoor bar, drinking red wine and eating tapas. April marks a new element for project spectrum - earth - colors: browns, greens, metallic. 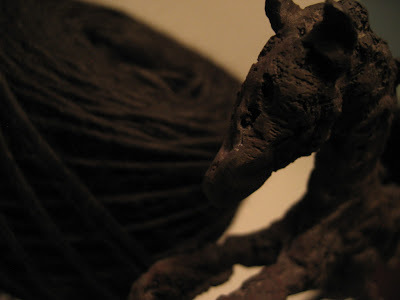 My bronze horse sculpture guarding my Blue Sky Suri Merino in the appropriate project spectrum colorway 'earth'. I know what that yarn will become; I just can't start on that yet - I have Mr. Greenjeans to finish.